Long Island Region President Nick LaMorte joins members of Long Island’s SEFA committee. From left, Linda Imbriano, Sonia Eddins, Randy Reissig, Nick LaMorte, SEFA Committee Co-Chair Melissa Shedd (seated), SEFA Committee Chair Stacey Pagan, Long Island SEFA Coordinator Millie Lucas and Kristel Shult. Not pictured: Yvonne Barbour, Shannon Burgess, Suzanne Cerruto, Kathy Smith, Karen Ramirez-Jurado, Deloris Pearson, Alissa Rathbun, Anita Douers, John Petroff, John Valentin, Barbara Reiszel, Iris Ostrowsky, Victoria Colasacco, Israel Triocche and Steven Bebrauskis. 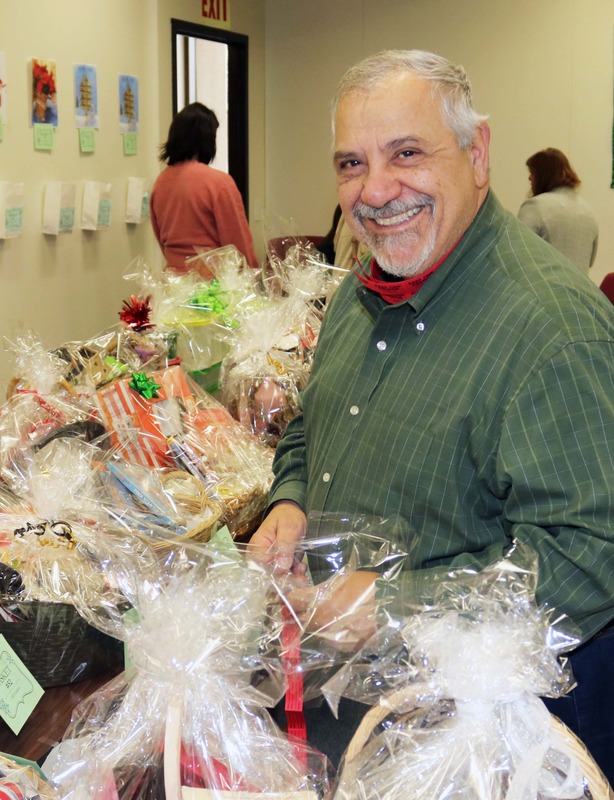 Long Island Region President Nick LaMorte bids on one of the more than 70 baskets being auctioned. HAUPPAUGE — CSEA members are at the forefront of community involvement through philanthropic endeavors. Many of our members are active members of organizations that raise money for those in need, including the Long Island State Employee Federated Appeal (SEFA) committee. SEFA is a state-sanctioned, charitable, payroll-contribution program established under state finance laws. The program is open only to state employees; SEFA does not apply to local government employees. SEFA distributes money to nonprofit organizations that provide numerous types of vital community services, including health care, services for children and senior citizens, domestic violence shelters and disaster relief. 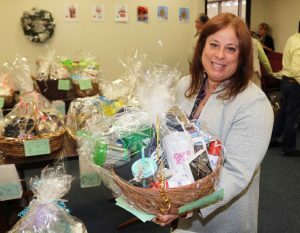 Committee Chair Stacey Pagan displays the CSEA/AFSCME basket up for auction. CSEA is a longtime supporter of SEFA through member donations and volunteer efforts. In our region, members once again proved our commitment to SEFA. The state Department of Transportation’s SEFA committee recently held their annual silent auction, which raised around $1,200. All proceeds will be divided between organizations that raise money to fight Alzheimer’s and Cystic Fibrosis. To learn more about SEFA, visit sefanys.org.